Want to be notified of new releases in hgneng/2048? Pull request Compare This branch is 16 commits ahead, 6 commits behind gabrielecirulli:master. A small clone of 1024, based on Saming's 2048 (also a clone). The official app can also be found on the Play Store and App Store! Anna Harren and sigod are maintainers for this repository. Many thanks to rayhaanj, Mechazawa, grant, remram44 and ghoullier for the many other good contributions. You can find the same information in the contributing guide. 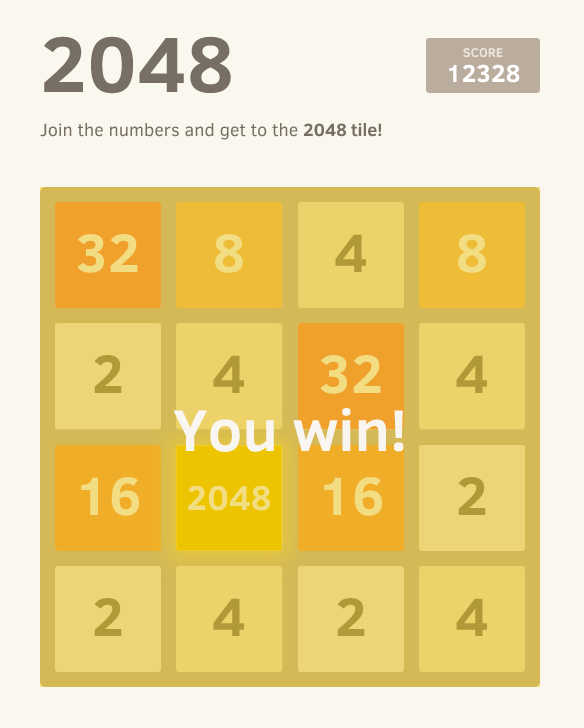 2048 is licensed under the MIT license. I made this in my spare time, and it's hosted on GitHub (which means I don't have any hosting costs), but if you enjoyed the game and feel like buying me coffee, you can donate at my BTC address: 1Ec6onfsQmoP9kkL3zkpB6c5sA4PVcXU2i. Thank you very much!